Animals play a special role in our day to day lives and many of us often wonder what our own pets do while we are away during the day. Whether we are at work, school, running errands, or going out to dinner, our pets usually have to stay home. 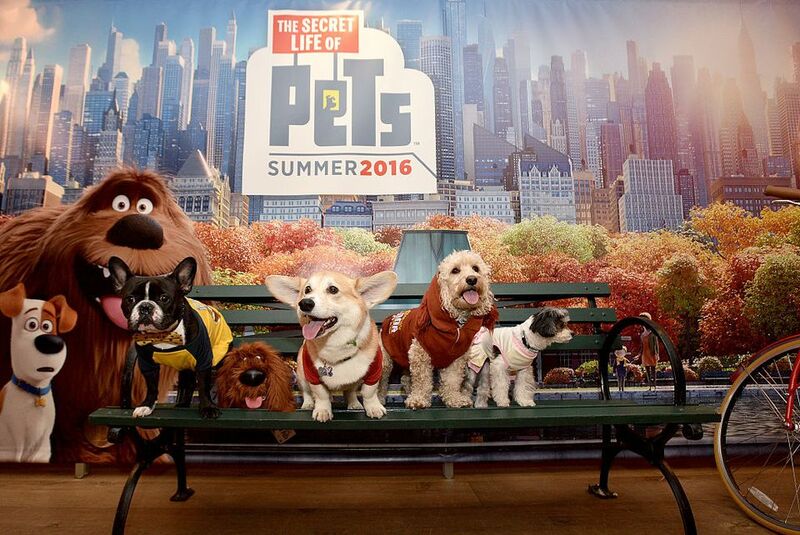 The animated comedy movie, "The Secret Life of Pets" by Illumination Entertainment and Universal Pictures, focuses on what our pets might do while we aren't watching and features several different kinds of pets, including some exotic pets. Mel - Mel is a purebred pug, a type of dog that is known for their curled tail and smashed in the face. They tend to snore and are very personable small dogs in real life and in the movie Mel is quite the lady-killer and a bit dopey. He spends his days scooting his rear end on the carpet, attacking pillows, and chasing off those hated reoccurring squirrels outside his window. Buddy the dachshund is his favorite dog and Mel just adores peanut butter. Max - Max is a small terrier mix that looks a lot like a Jack Russell terrier. Terriers are high energy dogs and are also very intelligent. His favorite toy is the tennis ball and his favorite person is Katie, whom he waits for patiently at the door when she leaves. His biggest problem in life is the newest dog, Duke, that Katie adopts. Duke - Duke is labeled as "massive" and is a little bit of everything (or as some people call a mutt). He is furry and brown, is a rescue dog and tends to think he can fit in small places. He loves hot dogs and takes up much more room than he admits. Snowball - Snowball (voiced by Kevin Hart) is a pet white rabbit which is considered an exotic pet or a pocket pet. He is one tough bunny that only appears to be sweet and innocent. He loves his carrots but really doesn't like humans. He wants to dominate the world. Chloe - Chloe is what some people might call "a typical cat" since she doesn't really want to be bothered unless food is involved. She has "resting cat face" which isn't very flattering and could stand to lose a few pounds but really wants to eat everything in the fridge instead. Gidget - Gidget is an adorable, white, fluffy Pomeranian who is your typical purse dog. She is fierce when she needs to be but would rather indulge in her favorite telenovela. She is 50% fluff and 110% tough, she knows she's cute, and she has a bit of a crush on Max. Sweetpea - Sweetpea is a classic green and yellow pet budgie (parakeet). Like rabbits, budgies are also considered exotic pets. Sweetpea loves to bust out of his cage when his owner leaves and fly (which is no surprise considering how terribly small the cage is in the movie). Buddy - Buddy is a black and tan dachshund, also known as a wiener dog. He is sarcastic, loves the stand mixer in his kitchen for the amazing back rubs it gives but isn't a fan of the mailman. Leonard - Leonard is a white standard poodle and the picture of sophistication - until his owners leave him home alone. Leonard's little secret is that he loves some good headbanging punk music and isn't afraid to let loose and change the music on the mp3 player. Don't let his haircut and pink collar fool you. The pets in this movie are so cute and lovable that there were toy versions of them that could be purchased as well as a variety of other items from PetSmart. Outfits, treats, beds, and toys were all available when the movie was released. The movie revolves around what pets do when we aren't watching and follows the featured pets as they go on a grand adventure. When Max and Duke get picked up by animal control a search party begins to rescue them when Gidget discovers her beloved Max is gone. Max and Duke get busted out of animal prison by Snowball and his carrot key but only if they agree to work for him alongside a variety of other misfit pets. Gidget and her team of house pets, including a disabled dog in a wheelchair, start out on a search to find their friend Max. Guinea pigs, sphinx cats, reptiles, birds, and numerous dogs all make appearances on the way making this truly a movie for all animal lovers. We probably think about it but do we really do anything to make sure our pet's lives are mentally and physically rewarding? Enrichment activities are things you can do to provide stimulation to your pet's brain and keep them active. Special toys designed to make your pet think can be purchased but you just need to get creative. Hiding food around the house and allowing your pet to seek it out or putting it inside objects that they need to figure out how to open provide mental stimulation at meal time and can be done with any species of animal (even reptiles). Leaving the television or radio on when you leave the house to provide your pet with sounds and pictures to keep them thinking and listening and not bored. When you are home you can play games that will help strengthen the human-animal bond with your pet. Agility courses are great for dogs, laser pointers and feather wands are popular with cats, and small objects that can be picked up by your pocket pet are fun to provide to your rabbit, guinea pig, or ferret. Puzzle toys are easy to make at home using items you'd otherwise throw away like toilet paper rolls with holes to hide crickets for reptiles and sugar gliders, woven paper for birds to shred (make sure there are no staples in it), and other simple items. Anytime a movie comes out that features animals those same animals suddenly become very popular in the real pet world. This movie is no exception and while it will encourage pet owners to possibly pay more attention to their beloved pets it will also create an influx of irresponsible pet owners who want the same animal as they saw on screen. These newly adopted pets often become short-term fascinations and are later abandoned or neglected when the appeal wears off. If you choose to get yourself a Gidget, Max, Snowball, Sweetpea, or other animals you see in the movie be sure to research the care requirements before adopting one.